The purpose of this conference is to educate practitioners to identify, treat and triage thoracic emergencies which can be lethal if not handled quickly and appropriately. Practitioners in the emergency department, hospital wards, intensive care unit and operating room are frequently encountered with thoracic emergencies although they do not always know how to best treat them or what practitioners should be consulted. 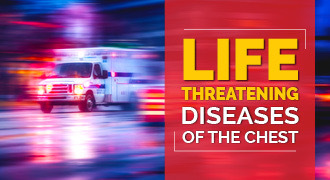 This symposium addresses the early and definitive treatment of life threatening chest diseases. What should I do about that pneumothorax?